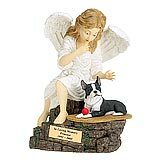 "I did receive the beautiful memorial for Pepe. It brings me great comfort and I know she would approve. Thank you so much for your condolences and the lovely card you enclosed. I appreciate your thoughts an Thank You for making this very difficult time a little easier! God Bless!" 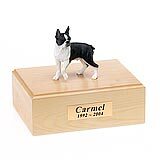 All available Boston Terrier dog urns and memorials will be displayed with the figurine on the Boston Terrier urn you select and in the appropriate size.